A new Pew Research Center survey shows that across 40 countries surveyed in 2015, a median of 67% use the internet and 43% report owning a smartphone. But one trend stands out: People in emerging and developing nations are quickly catching up to those in advanced nations in terms of access to technology. 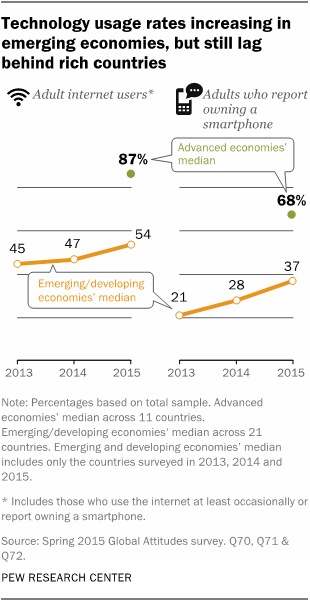 1About half of adults across the 29 emerging and developing economies surveyed say that they use the internet. While many people are not yet experiencing the technology revolution, it also means most people in these countries now use the internet. Among the 21 countries surveyed in both 2013 and 2015, a median of only 45% had access in 2013, but that number had risen to 54% by 2015. 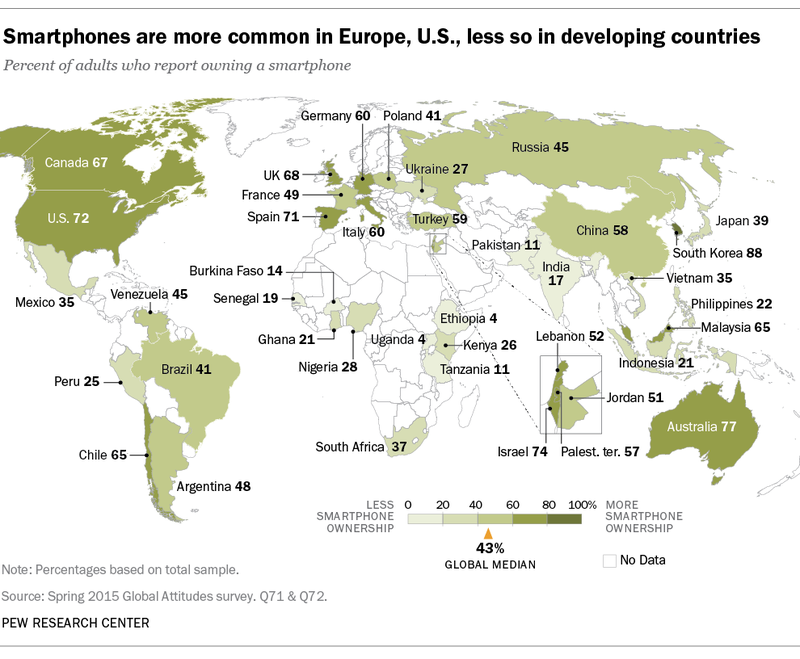 2Smartphone ownership rates are rising in many emerging and developing nations, and about a third of people across emerging and developing nations reported owning a smartphone in 2015. Given this sharp upward trend, it is expected that smartphone ownership will continue to grow in these countries and approach the levels seen in advanced economies (a median of 68% in the current survey). 3 For people who do have online access, social networking is popular nearly everywhere, but especially in the emerging world. For example, nearly nine-in-ten online Jordanians, Indonesians, Filipinos and Venezuelans report using social networks. This compares with only 57% of online French, 54% of online South Koreans and half of online Germans. 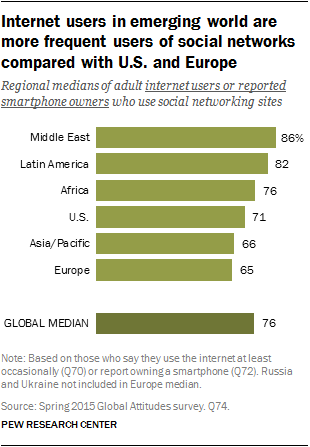 This also means that among internet users, social networking is more popular in the Middle East and Latin America than it is in the U.S. and Europe. 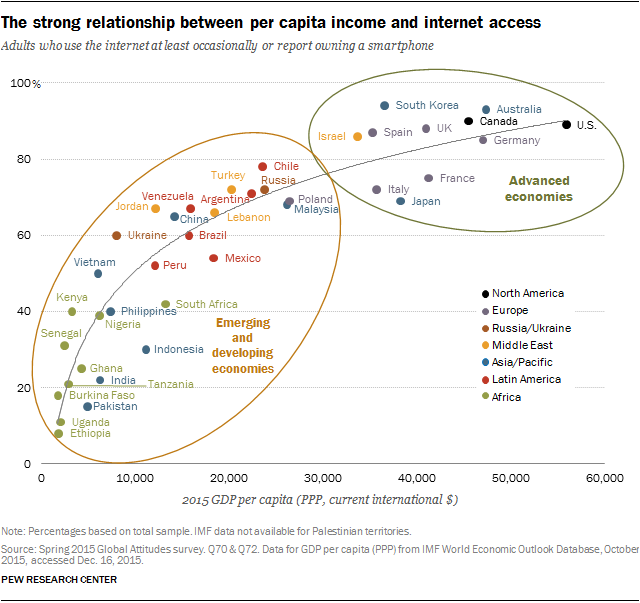 4Internet access is strongly tied to per-capita national income. Richer countries in the survey tend to have higher rates of internet access or smartphone ownership compared with poorer nations. This also holds true when emerging and developing nations are compared with each other. While there is a strong correlation in this relationship, as middle-income countries approach total internet saturation it is likely that this association will diminish. 5Global Millennials are well on their way to being the first generation for which internet use is nearly universal. In every nation surveyed, especially in emerging economies, younger people ages 18-34 are more likely to use the internet and own a smartphone compared with people ages 35 and older. For example, 81% of Millennials in Vietnam use the internet compared with 25% of non-Millenials in Vietnam, a 56 percentage point difference. Additionally, people with more education and higher incomes are more likely to be technology users in nearly all of the countries surveyed. See our interactive table on technology adoption around the world.